In today’s Gospel we hear the story of Jesus healing a blind man. If you spend even a little time looking through the Gospels, it becomes immediately obvious that Jesus does a lot of healing. In fact, accounts of healing and teaching take up the vast majority of the Gospels. If we then consider this in the light of St. John the Evangelist’s words: “Jesus did many other things as well. If every one of them were written down, I suppose that even the whole world would not have room for the books that would be written” (John 21:25), then the sheer volume of teaching and healing that Jesus did must have been immense. As mentioned in yesterday’s post, the work that Jesus did always centered on showing us who God is, and who we are in relationship to Him. This is the path of salvation, of reconnecting with the source of life, which is God. Jesus healings and teachings were never done for show or to show that He and His followers were “right”, but rather, they always had the clear purpose of showing the way to salvation. The healing account we read about in today’s Gospel is unique to St. Mark’s Gospel. 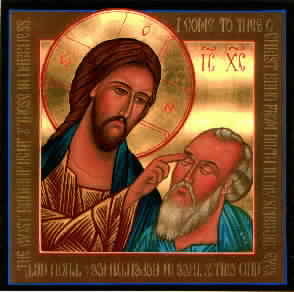 Its striking in that we see the manner in which Jesus heals (spitting on the man’s eyes! ), and also in that it shows a process of healing. At first the man can see, but only in shadows. Jesus then lays his hands on the man and the man’s sight is fully restored. Even before that, there is the tender scene in which Jesus actually leads the man out of the town by the hand. This is a beautiful picture which shows the personal character of God’s relationship with man. Jesus doesn’t heal like a magician, or a television preacher “Bam! You’re healed!” He takes the blind man by the hand and goes for a walk with him. I like to think that a conversation occurred. Jesus found out about the man’s life, perhaps listened to him describe the struggle, shame, and difficulty he had faced in his life. Jesus applies the first healing and then waits, and asks the man what he can see. He is patient. He then heals the man fully. The man looks up, and the first thing that he must have seen clearly was the face of Jesus. In our lives we often do not see clearly. Our circumstances, our past, our struggles, our sins cloud our vision. How good would it be to take a walk with someone who would listen, and who could offer healing? The amazing thing is that Jesus still offers that same attention, that same healing as He did when He was in His earthly ministry. The way to begin taking that walk is to pray. Simply tell Jesus what is on your heart and be honest. Seek Him honestly, not with an agenda or in order to try to manipulate Him. As much as you are able, just be. Even ask Him for the strength to just be, to quiet the distractions, the circumstances, the noise, and just be in His presence so that He might lead you on the path of healing. Just like in today’s Gospel, the cure is not magic, so it may take time. In the Gospel today, the time that elapses before the man is fully healed is short, but it signifies a process of healing. How good it is that we have a God who cares, and who will walk with us, not just rule from on high, far from our struggles. How good it is that we have a God who is personal, not abstract or theoretical. How good it is to have a God who is in the business of healing.